Rhoda Cummings submitted this story as an example of the value of making your points crystal clear to young people when you are teaching them Bible truths. Rhoda and her husband Bruce labored for the Lord for many years in Venezuela. Christians are involved in countless efforts to reach the young with the Gospel. Young men and women are burdened about kids in their community and they are working hard to reach them. Often there is a great deal of effort and zeal but what is really lacking is the content. 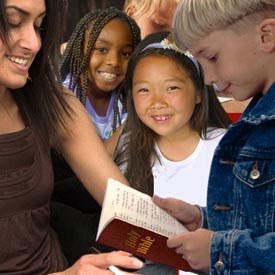 Sometimes kids are asked to memorize verses and the gospel truth contained in the verse has not been explained to them. Other times, stories are told and the teacher (male or female) has not clearly hi-lited the main point of the story. And, then there are the songs we teach them. Too often, the songs are about the Christian life - not Gospel songs. As a minimum, if we are singing songs that only a saved youth can truly sing, that should be announced beforehand. For example, if the song is about being in the Lord's Army - then tell the kids first - no one is in the Lord's Army until they trust Christ. If it is about having joy down in their heart....then explain, that only saved boys and girls have joy in their heart. Tell them they can learn the song now so they will be able to genuinely sing it when they know Christ. The Coming of the Lord for the Believers was the subject in the teenagers class that day and the key statement was “I will come again and receive you unto myself’ (John 14:3). The class read of the Ascension and the words of the angels to the apostles in Acts 1 “ this same Jesus …shall so come …”,.and learned also for whom He will come, and the manner of His coming, as these are taught in 1 Thessalonians 4. The pupils contributed, telling of current events: earthquakes, wars, news of the nation of Israel, etc. and the teacher spoke of “signs” to take place before the Lord comes to reign, but it was emphasized that not one sign needs to be fulfilled before He comes to the air for His saints. He could come at any time and take the saved ones to be with Himself. An object lesson was presented, one that other teachers have used to profit. A tray had been filled with sand, and nails, some steel ones that contained iron and others of aluminum, were buried in the sand. Several pupils took their turn passing a magnet above the sand while the class watched the steel nails drawn up with the magnet. And so the teacher emphasized the solemn truth, that when the Lord comes, those who have accepted God’s offer of salvation will go to be forever with the Lord, while those who have never put their faith in Christ will be left behind for judgment. Several weeks later, after a gospel meeting, Daniel, one of the boys in that class, told the teacher he had just accepted Christ as his Saviour. Years went by and Daniel, then a young man in assembly fellowship, gave his testimony in a gospel meeting. He told of his rebellious thoughts as a teenager, when he planned to leave home so he would no longer be obliged to attend gospel meetings. He had heard of the Coming of the Lord but gave it little thought until that day when he watched the magnet draw up the steel nails and he realized Christ might come at any time and his parents and siblings would go to be forever with the Lord and he would be left for the judgment. He said he had no peace until he put his faith in the work of Christ that night in the gospel meeting. Two days after giving his testimony in that meeting he was riding his motorcycle home from work when he was struck by another vehicle and was killed instantly. Daniel was ready to go. We have the responsibility of communicating the gospel to the children in UNDERSTANDABLE TERMS. Each lesson should be based on ONE Bible Truth, and this truth should be presented in a number of ways. We may get the children’s attention by talking about the children’s experiences, even “supposing” certain happenings. We may tell a Bible story, draw on a board, show pictures or present objects, or with older pupils teach the words of a gospel hymn that expresses the truth to be taught. Each activity should help the class to understand the Bible Truth. We should read the key statement from the Word of God, perhaps just part of a verse and this key statement should be repeated throughout the lesson period until the class can say it by memory. The Lord Jesus taught the people by telling everyday stories – parables; by referring to Old Testament events such as: “Remember Lot’s wife”; by asking questions and waiting for answers- “Whom say ye that I am?”; and by presenting object lessons-setting a little child in the circle to teach them their need of humbling themselves. The Lord Jesus left us an example that we should follow.